Sack automation solutions from Morray Engineering and Walthambury reduce or eliminate the need to manually perform repetative tasks allowing for a more efficient deployment of labour. Typically the combination of a Bagging Machine, Sack Placer, Sack Top Control System and either a fixed head stiching solution or heat sealer can allow a packing line to be run by a single operator. The Morray STC8600 incorporates a pneumatic bag clamp to hold the bag during the filling process. Once the bag is filled it is lowered onto an Intralox conveyor, at the same time two spreader fingers descend with the sack and spread the sack top. Two support arms then hold the sack top in the spread position and convey the filled sack foward to the stitcher or heat sealer before being released. The sack is supported at all times during this cycle to ensure a even, uniform seal every time. Gross weighing option incorporates the trusted M425A weigher for fast and accurate weighing. Net weighing option can be used with our M550 and M720 weighers. Ensures rapid, stable, upright transfer from bag clamp to stitcher/sealer for uniform, parallel, precision sealing. Full pneumatic operation with PLC control for reliability. Adjustable board formers for different bag specifications. Can be integrated with heat sealing or stitching system. Can be used with WASP or WASP-Lite sackplacers.. The Morray STC8900 incorporates a pneumatic bag clamp to hold the bag during the filling process. Once the bag is filled it is lowered onto an Intralox conveyor, at the same time two spreader fingers descend with the sack and spread the sack top. Up to 12 bags per minute depending on materialand bag type. Ensures rapid, stable, upright transfer from the filling station to the sewing head or heat sealer for uniform, parallel, precision sealing every time. Either L-R or R-L system directions available. 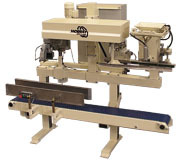 Can accommodate Newlong, Fischbein, Union Special and Reed Medway sewing heads or a heatsealer. All on either fixed height or adjustable mountings. Adjustable guide boards for different bag specifications. Operates with Intralox flat track conveyor. 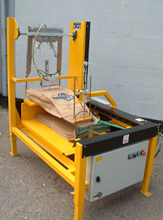 Designed for use with a Morray WASP or WASP Lite sack placer, alternatively sacks can be manually placed. Entire sack top control system mounted above the conveyor on one robust chassis leaving floor area clear. Can be used with existing gross or net weighers. Fitted with either a Newlong NP7A or DS9C head as standard. 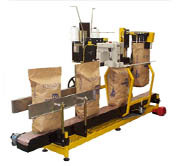 Walthambury sack placing solutions reduce the need for operator input at the bagging head. Sacks are placed rapidly and accurately to maintain a uniformity of fill and seal of the bag. 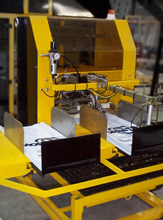 Based around a feed and pinch roller system providing precise bag registration, consistent bag pick up and placing. This simple design, agile mechanical solution incorporate many features for robust reliability. Paper, plastic or woven polypropylene bags. Up to 10 bags/min - dependant on material/product. Easily integrated with existing or new installations. Automatic 2 x 200 (400 bag) magazine. Stainless Steel for food quality. Ideal for lower throughput sack placing applications, the MASP Lite features simple, reliable design and a robust balance of economy and performance. Venturi vacuum unit minimizes noise, improves reliability and allows precise bag pick-up and release control. Simple mechanical design utilizing ‘off the shelf' components, results in high reliability, low downtime and cost of ownership. Flexible design allows easy integration with existing or new installations from most filling manufacturers systems. PLC controlled for long term reliability and minimum cycle times giving optimum throughput on a wide variety of bag sizes. Maximum speed up to 350 bags per hour.